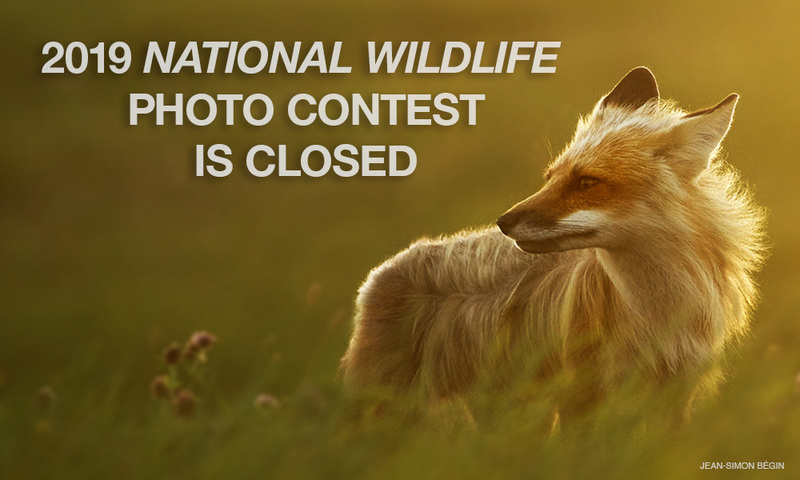 The 2019 National Wildlife Photo Contest is closed. The National Wildlife® Photo Contest, which began more than four decades ago, celebrates the power of photography to advance conservation and connect both photographers and viewers with wildlife and the outdoors. The most compelling nature images can help protect wildlife in profound ways. If you have already entered this contest, we thank you sincerely for your contribution and we’re glad you’re a part this growing family of talented, dedicated people. Entry Fee: Your fee helps support the National Wildlife Federation's work to protect wildlife and wild places. No limit on the total number of images allowed. A selection of the winning photographs and honorable mentions from the 2019 contest will be published in the December-January 2020 issue of National Wildlife magazine. All winning images and honorable mentions will also be published on the National Wildlife Federation’s website, and some will be featured in an exhibit in downtown Washington, DC. NWF anticipates notifying winners by early October 2019. Consider donating: The National Wildlife Federation greatly appreciates when photographers choose to donate some of their images. These donations help support our mission to protect wildlife and habitats. Photographers will always retain ownership and rights to their images. We encourage you to consider donating some of your images to the National Wildlife Federation to help us save the world’s treasured wildlife species and their habitats. See more information about donating your photos in the Rules section.